Google playstore Error 905 is one of several play store error that usually occur when someone is trying to download a very large application from google playstore, often times such error can be so annoying and frustrating but the good news the problem is from your google playstore application making it possible to solve with few steps. Error 905 in most cases is usually caused by corrupt file data or failed update in the Play Store. The best and easiest solution for solving such is by uninstalling Play Store latest updates and install them again. how then could this be done? First Step To Fix Google playstore Error 905 : Go to Settings and Tap on Apps: To do this, swap the phone notification tab down or tap the app drawer, locate the gear-shaped. In Settings, scroll down to find Apps and then search for Google Play Store. Depending on your Android version, the apps may appear under “App Manager” or “App Management”. Second Step To Fix Error 905 Google playstore Error : Uninstall Google Play Store updates, Once you find it, tap on the Google Play Store icon, which will display google playstore details, Tap on “Uninstall updates” to revert the Google Play Store app back to its original version. Also tap “Clear data” and “Clear cache” as well. Third Step Update Google Play Store: Opening the Google Play Store app and wait for it to load. the time it takes to load depends on your internet connection speed, the Play Store app will shortly update itself and hopefully fix error 905 along with it. 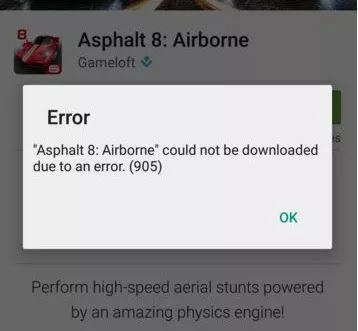 Try downloading the app or game that gave you error 905 earlier and confirm whether the issue has been fixed or not.